Of the variety of fundraising programs that we have tried, Bucky Books is the easiest one to coordinate and run. The Fundraising Team is very organized and does all of the bookkeeping work for us. They respond quickly to requests of more books, and notify us in advance of upcoming deadlines/dates. The Bucky Book has been an amazing fundraiser for our grade level. The Fundraising Team is extremely helpful and easy to work with. They are accurate with the time frames regarding when you will receive the books, responds promptly to emails or phone calls, and makes the entire program easy to run. Our grade level switched to the Entertainment Book for a couple of years and our sales dropped significantly. We quickly returned to the Bucky Book and have never looked back. They recommended that we should send a book home with every family and it would increase our sales. Although resistant for a while, we finally took her advice and our sales easily doubled! We have been able to purchase books for our book room, buy an Accucut machine and dies for our school to use, and have been able to reduce the cost of our field trips due to the money we raised. Without a doubt, a winning fundraiser that benefits our elementary students as well as providing scholarships to students at UW. I can only use positive words about this fundraiser! Working with Select Enterprises over the last 5+ years in selling the Bucky Book has proven to be a great asset to our DECA chapter! The proceeds have played an instrumental part in offsetting student costs associated with attending leadership conferences, competitions at the district, state and national levels as well as subsidizing travel costs. One of the best things was working with their staff. They are extremely organized and helpful and truly makes the process enjoyable! Thank you Bucky Book!! DeForest DECA would like to extend a thank you to the staff at The Bucky Book. With their assistance and wonderful product, we were able to exceed our fundraising goals this past year. 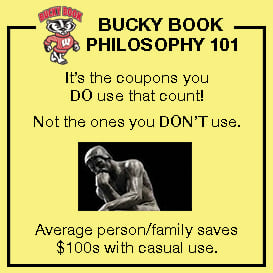 The Bucky Book sells itself and is very profitable for our organization. Selling Bucky Books is an awesome fundraiser for my group. It is a wonderful product that practically sells itself and customers look for it year after year. For not too much effort, my students can make a significant amount of money towards their educational travel. The Bucky Book staff makes it so easy. They are professional and super organized and are always willing to answer questions. Angel’s Wish has been participating in the sales of the Bucky Book for the past 10+ years, it has been a won­derful way to help subsidize our work with rescuing stray and abandon cats/kittens. During the years we have been blessed with meeting many people and some of that we originally sold books to have become a part of our organization so not only have we benefited from the money earned but we also earned the help and friendship of new volunteers. It is a great way to support your favorite organization and you can’t beat the buy one get one savings!!!! 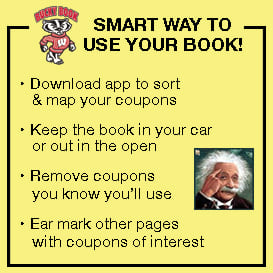 The Bucky Book program has been a great way for our group to raise money! 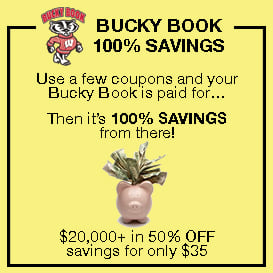 The public knows the benefits of buying Bucky Books and are happy to help our agency with fundraising. The staff is readily available to meet, help supply tips to encourage selling, and makes the process easy. We have used the money we earned to buy new basketball uniforms and equipment for our athletes. Thank you Bucky Books and everyone who bought a book from us to support our agency!